A New 'Smart Rifle' Decides When To Shoot And Rarely Misses : All Tech Considered A new rifle goes on sale on Wednesday, and it's not like any other. It uses lasers and computers to make shooters very accurate. A startup gun company in Texas developed the TrackingPoint rifle, which is so effective that some in the shooting community say it should not be sold to the public. 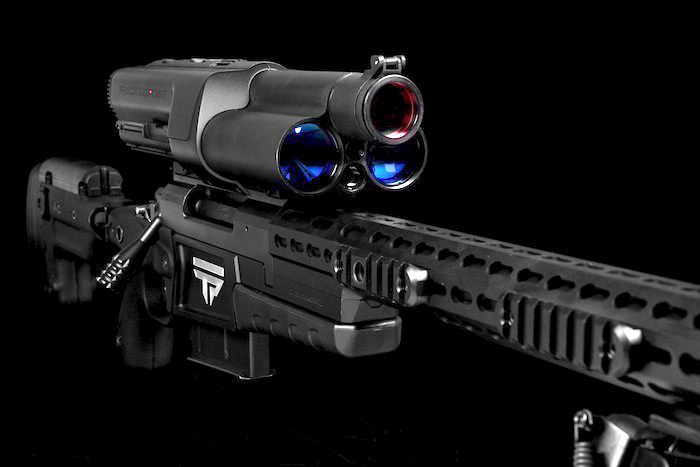 A TrackingPoint rifle features a high-tech scope that includes a laser rangefinder and a Wi-Fi server. The rifle's scope features a sophisticated color graphics display. The shooter locks a laser on the target by pushing a small button by the trigger. It's like a video game. But here's where it's different: You pull the trigger but the gun decides when to shoot. It fires only when the weapon has been pointed in exactly the right place, taking into account dozens of variables, including wind, shake and distance to the target. "Think of it like a smart rifle. You have a smart car; you got a smartphone; well, now we have a smart rifle," says company President Jason Schauble. He says the TrackingPoint system was built for hunters and target shooters, especially a younger generation that embraces social media. "They like to post videos; they like to be in constant communication with groups or networks," Schauble says. "This kind of technology, in addition to making shooting more fun for them, also allows shooting to be something that they can share with others." "It's the traditional shooting fish in a barrel or the sitting duck. I mean, there's no skill in it, right? It's just you point, you let the weapon system do its thing and you pull the trigger and now you've killed a deer. There's no skill," Wilbratte says. Can 'Smart Gun' Technology Help Prevent Violence? "It has a password protection on the scope. When a user stores it, he can password protect the scope that takes the advanced functionality out. So the gun will still operate as a firearm itself, but you cannot do the tag/track/exact, the long range, the technology-driven precision-guided firearm piece without entering that pass code," he says.